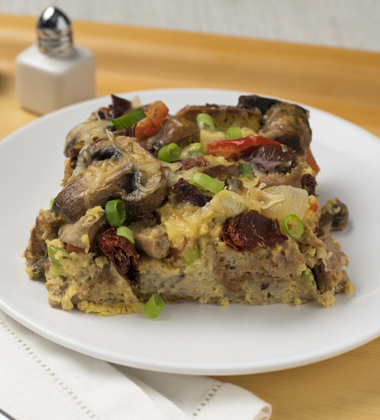 A popular brunch dish beautifully packed with flavor made with Campbells® Healthy Request® Condensed Cream of Chicken Soup, turkey sausage, sun dried tomatoes, mushrooms, garlic, spinach and whole grain French bread. garlic, peeled, roasted, chopped	 2 tbsp. 1. Over medium heat in a large sauté pan, heat canola oil. 2. Add onions. Sauté for 5 minutes, stirring often to brown evenly. 3. Add turkey. Cook for another 4 minutes. 4. Raise heat. Add mushrooms and red peppers. Cook for additional 3 minutes. 5. Add sundried tomatoes and garlic. Cook for 1 minute.Transfer mixture to a cool bowl. Reserve. black pepper, ground	 0 1/4 tsp. 1. 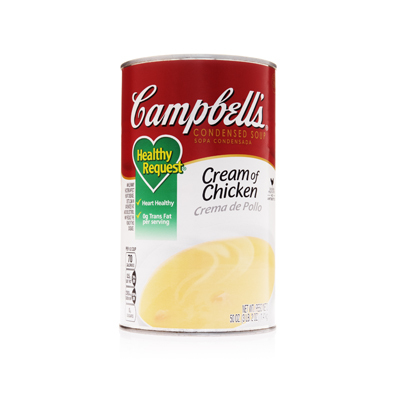 In a large mixing bowl, combine Campbells® Healthy Request® Cream of Chicken Soup, eggs, milk, half the cheese (2 oz.) and pepper. Mix well. Reserve. 1. Lightly oil a full size hotel pan. Layer bread into bottom of the pan. Add chicken vegetable mixture evenly on top of bread mixture. 2. Add egg mixture. Gently shake the pan to ensure even distribution of the ingredients. 3. Bake in a preheated 350°F oven for 40 minutes. Check after 30 minutes to ensure the browning is even. Check for doneness, sprinkle with remaining cheese (2 oz.). Bake for additional 5 minutes. Let set for 30 minutes prior to serving. To Serve: Using 1-#4 and 1-#16 spoodle or scoop, portion 1-1/4 cups onto serving plate. Serve immediately. black pepper	 0 1/4 tsp. 2 pounds turkey sausage required in this recipe.